Sorry I am out of synch with my posting again and this is also a day later than my usual midweek post, I’ll try and get back to normal soon. OK I have to confess the plan to tidy up the art room (again) was a massive fail (again). When I woke up on Monday (bank holiday) it was a beautiful sunny day so decided to do something outside instead. I find it fairly easy to find something better than tidying up my art room. I am not really a gardener, in fact I’m not a gardener at all, but I do things like cutting the grass (occasionally), hard landscaping, building things and occassionally helping T out. First thing on Monday morning I drove T to the local garden centre to purchase some tomato food and while we were there I noticed a lot of cyclamen plants in flower. I said “I thought cyclamen were winter flowering plants”. T replied, “Well ours are, or at least they were, I think you removed them all when you tidied up the woodland area of the garden recently” Ooops! I thought that was just dead stuff I was clearing up, he commented that it had only taken him 17 years to cultivate that patch. I felt really bad, but he was philosophical about it and said “Well they might grow back, despite your best efforts to remove everything”! He had previously mentioned to me that two branches of a big Bay tree in the cemetery that were overhanging our garden, had begun to interfere with the television reception. I hardly ever watch television so I was not aware of this. T can’t go up ladders a) because of his dodgy leg and b) because of his vertigo so I got the ladders out, climbed up and sawed through the two branches, which (fortunately) fell onto the hedge between our garden and the cemetery. T helped me drag them from the top of the hedge into the cemetery and then we cut them up and put the pieces into bags. I put the bags into my ‘new’ car and drove to the local tip to dispose of the rubbish. All of the above took up most of the day and I had just sat down, outside, on the decking to work on my art journal when T got a phone call. I can’t go into details but he had to get to an urgent meeting in the next town in 15 minutes. The trip normally takes 20 minutes but somehow I managed to get him there on time and then I had to hang around for a couple of hours until the meeting finished. I didn’t really mind as I knew T was doing good work but it meant that there was no tidying of the art room and no art journaling either. The page above is page 3 of my 5th Teesha Moore inspired journal and on this piece I was practising a different type of lettering. 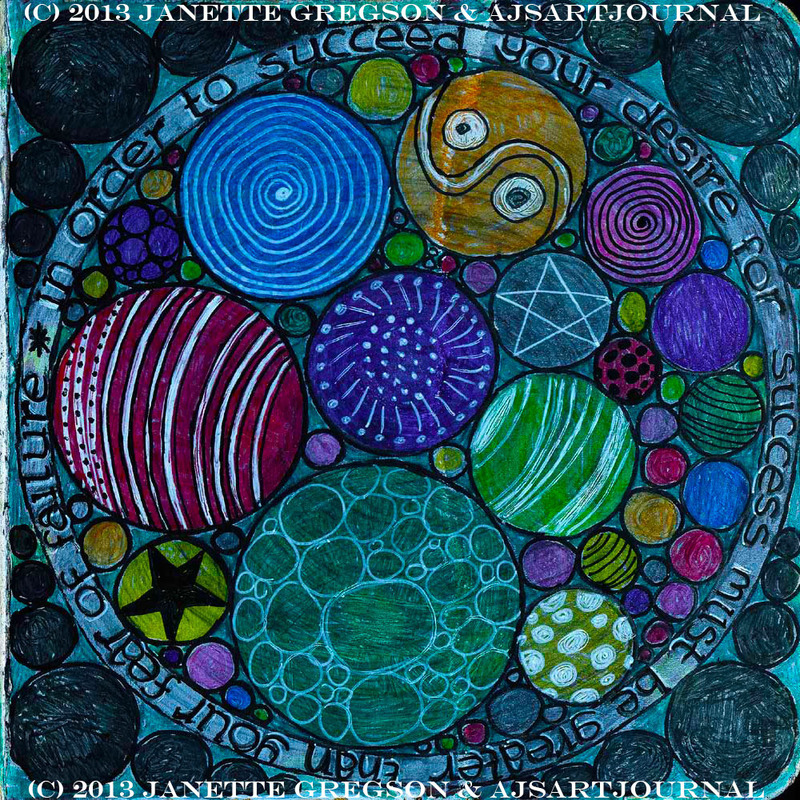 © Janette Gregson and ajsartjournal, 2013. Unauthorized use and/or duplication of this material without express and written permission from this blog’s author and/or owner is strictly prohibited. 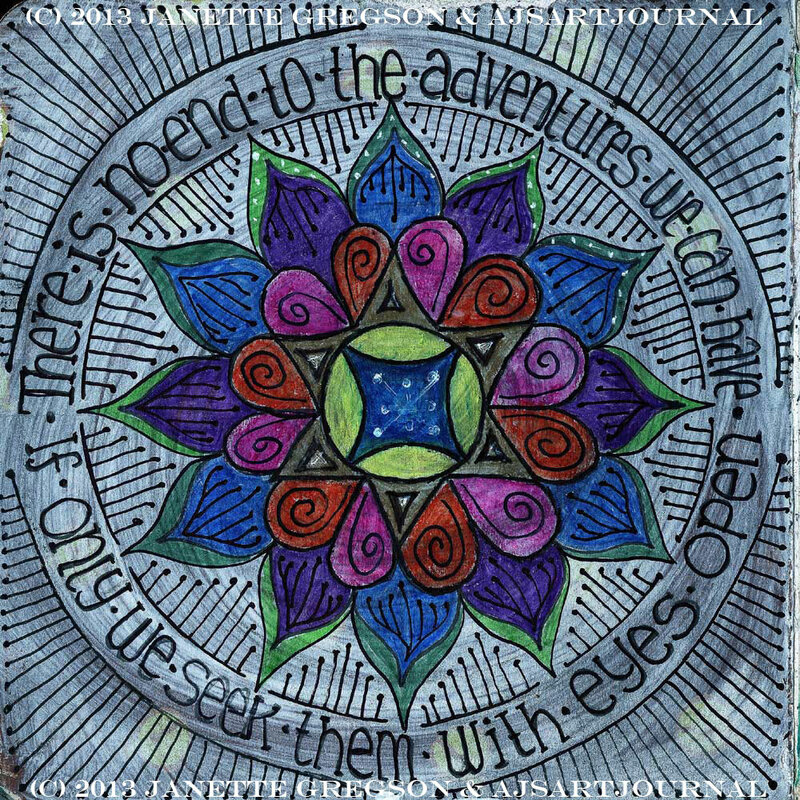 Excerpts and links may be used, provided that full and clear credit is given to Janette Gregson and ajsartjournal with appropriate and specific direction to the original content. I hope all is good with you, everything is well here. It’s a bank holiday weekend in the UK which means no work tomorrow – Hurray! I have been trying to de-clutter my life, with varying degrees of success. Yesterday I took three sacks of clothes to one of the local charity shops, so now I can open and close the drawers in my bedroom and find things easier in my wardrobe. Hopefully I won’t miss anything I threw away, but it felt good to do it. Before I went to the charity shop I went out and exchanged my old car (plus some money) for a newer one. This car is so different to my old one, which I had for years, it is going to take a bit of getting used to, but I am happy that I made the change. Yesterday afternoon I worked with my friends from the history group sorting out our next exhibition. We have put in such a lot of work on this exhibition I think it is going to be fantastic. There is still more work to do before the exhibition opens on 13 September, but we are definitely making good progress. If you are interested you can read about it here. Today I have tried again to tidy up my art room, this is much harder than getting rid of clothes because everything in my art room is useful, interesting and distracting (and there is so much stuff in my room) I have made some progress. Still lots more to do though! I also took my parents out for a drive in my ‘new’ car and I cut the grass and tidied up a small area of the garden. So it has been a fairly good day, the weather has been good too, it looked like it was going to rain, but that held off and now, even after dark, it is still and warm outside and I can hear the sounds of a firework display going on somewhere in the town. And the bonus is I have all day tomorrow to continue with the tidying and hopefully will also have time for some art. 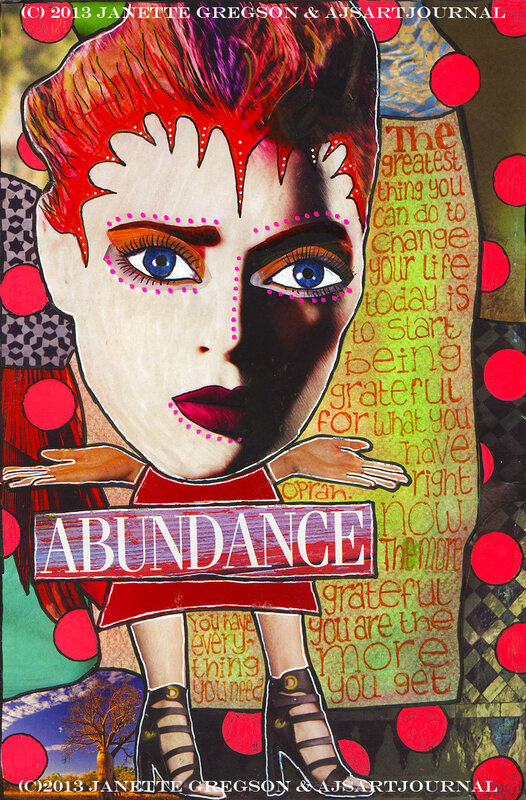 The page above is the second page from my fifth Teesha Moore inspired journal, I really like this page – the collage and the colours and a great quote by Oprah “The greatest thing you can do to change your life today is to start being grateful for what you have right now. The more grateful you are the more you get. You have everything you need”. I am grateful, my life is good. Things are changing in my life for the better and today I was thinking about some of the people who have influenced these changes. It’s interesting that initially at least most of them I met either on-line or through correspondence. My friend G has been my pen-friend for about 30 years, she lives in the Hollywood Hills above Los Angeles and we met really just by chance. Something horrible happened to her in a foreign country and I happened to be friends with someone she met while she was undergoing this terrible ordeal. G and I started corresponding with each other and became good friends. We have since both lost touch with the person who introduced us but we have had a long and loving correspondence. Her misfortune was my good fortune in that I met a true and dear friend. Over the years I have met G in person on several occasions, both in the UK and at her home in LA and she has had a profound and positive influence on my life and I love her. Another person who I only ever knew as Pix I met on the Lomography website and I’ve never met in real life. I didn’t even really know him that well, but apart from being an outstanding photographer he was always upbeat, positive, funny and friendly. His attitude to life made a big impression on me and I decided that I wanted to be like that too. I think that is when I first decided that I wanted to change and become a more positive, happy and contented person. I also met a man called Tracy Moore on the Lomography website he is lovely, friendly and quirky and also a great and prolific photographer. In 2007 I attended the Lomographic World Congress in London. Attending that event, with hundreds of people from all over the world, was really scary for me. I’m a country girl from a small town and I am really quite shy and insecure so it was a huge act of bravery for me to attend on my own. I was really fortunate to meet up with Tracy and his daughter, Trista, at the Congress and we spent a lot of time together. They were both so warm and kind to me. The added bonus to this was that Tracy carried around with him several different cameras AND a huge hand made journal (which he encouraged everyone he met to draw or write in). 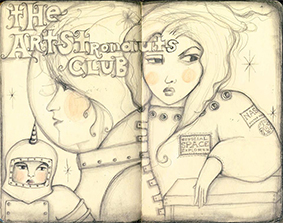 This was the first time I had ever heard about art journalling and I was intrigued. As a result of meeting Tracy and Trista, I eventually discovered Teesha Moore (Tracy’s wife) and immediately fell in love with her art. Then last year I was fortunate to be able to attend the Call of the Wild Soul Art Retreat in the UK where Teesha was one of the teachers. That event had a big influence on my art and my life. Not only is Teesha a great artist she is one of the most generous and big-hearted people I’ve ever met. 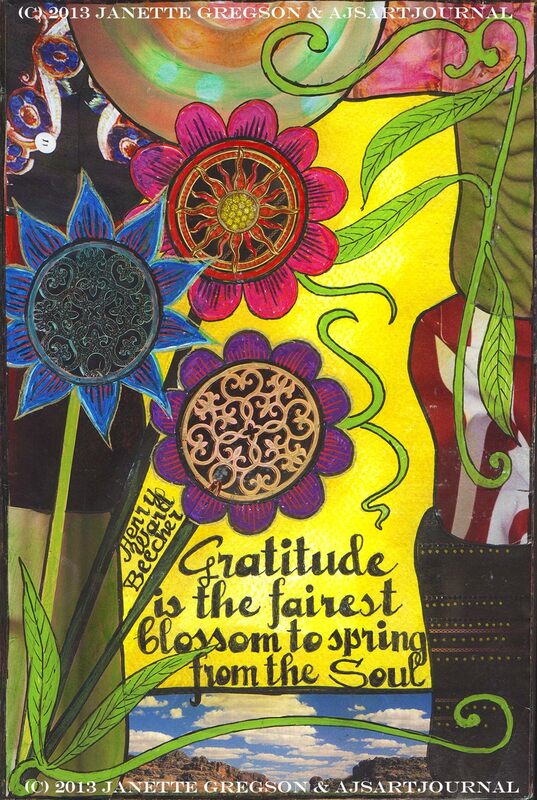 Through art journaling I also met, online, Gretchen Miller who is an art therapist. 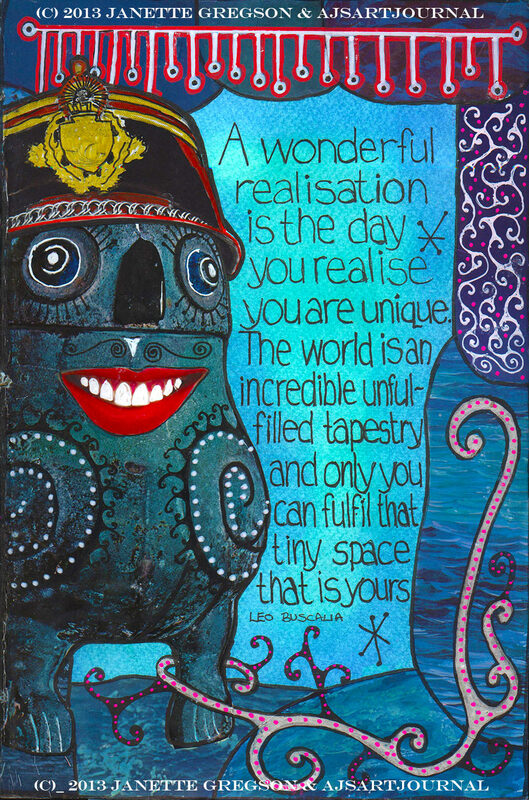 Gretchen ran a workshop on 21 Secrets in 2011 and it was in this workshop I learnt about making Revo-lution books and how visualizing your intentions into your artwork can be so rewarding. And recently I met another person online who is having a massive positive effect on my personal growth and well-being. Some of my art work is featured on the Tiny Buddha website, the whole website is well worth checking out if you want to start feeling good about yourself. As a result of being featured over there I’ve met Dr Amy Johnson. 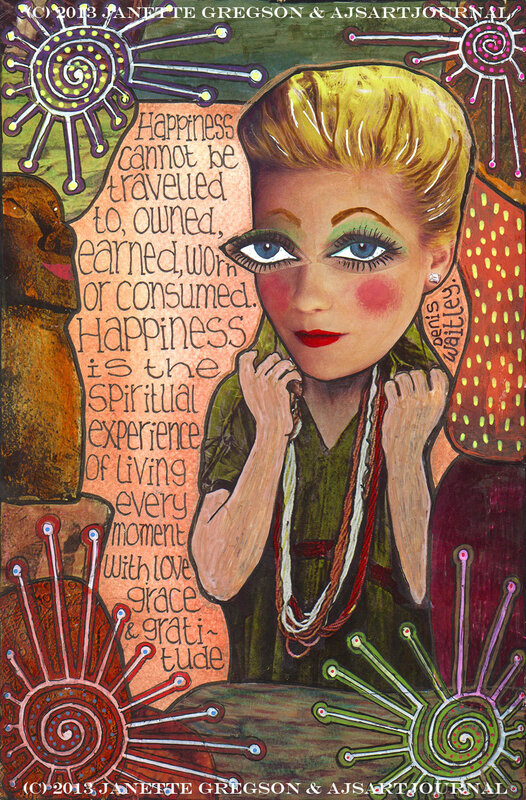 I love her outlook on life, what she says really resonates with me and I am learning so much from her. I am so grateful that all these people came into my life at the exact time I needed them. Have a good rest of the week and I’ll see you soon. I hope you have had a good weekend and are ready for the week ahead. I’ve had a weekend on my projects, on Saturday I worked with some friends from the history group preparing for our next exhibition in September. Today I got up early and took my car to the local hand car wash. I’ve never been there before, normally I take my car to the drive through machine but today I wanted the inside cleaned too. Well I can’t trade it in if it’s not clean inside can I? In 20 minutes my car was cleaned inside and out by a team of friendly young men, hard-working young men, and it was cheap too. I spent the rest of the day working on challenge on my other project. Although I can’t tell you about it yet I can tell you that it is making me create my art in different way. I’m still doing collage and pen-work, but I am using a different source for my collage materials and I am having to work in a sort of ‘back to front’ process. It’s a bit like working out a puzzle and I am loving the results. 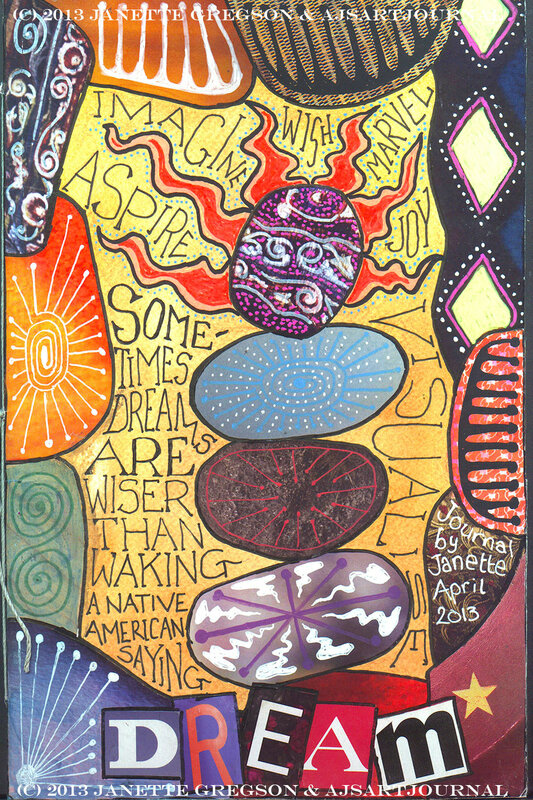 The page above is the front cover of my 5th Teesha Moore inspired journal, which, as you can see, I made in April of this year, just before I did my first ever art journalling workshop. Have a great week and I’ll see you soon. Half way through the week already and things with my projects are progressing well. I think I may have found a car to replace my old jalopy, actually the man at the garage showed me two today, both within my price range and both reasonable looking cars. I am going back after work on Friday to go for a drive in them to see what I think. My old car has done me well and I have loved it, but it’s getting old and ‘crabby’ now and I want something newer, more economical and reliable, something that will last me a few years. I’ll let you know how I get on, it will be a relief when it’s finally sorted out. Here is another Mandala from my Circles of Wisdom Book, I am coming to the end of this book now, I think I will have to make another one, it’s very calming and relaxing drawing these circles. 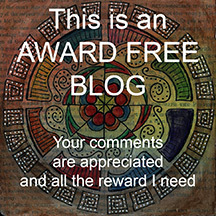 If I was going to nominate other blogs for any awards it would be those listed in the side bar of my home page and I recommend that you take a little time to visit those blogs and see the amazing art work produced. Especially that produced by Teesha Moore and her lovely husband Tracy. Cats are strange creatures aren’t they? 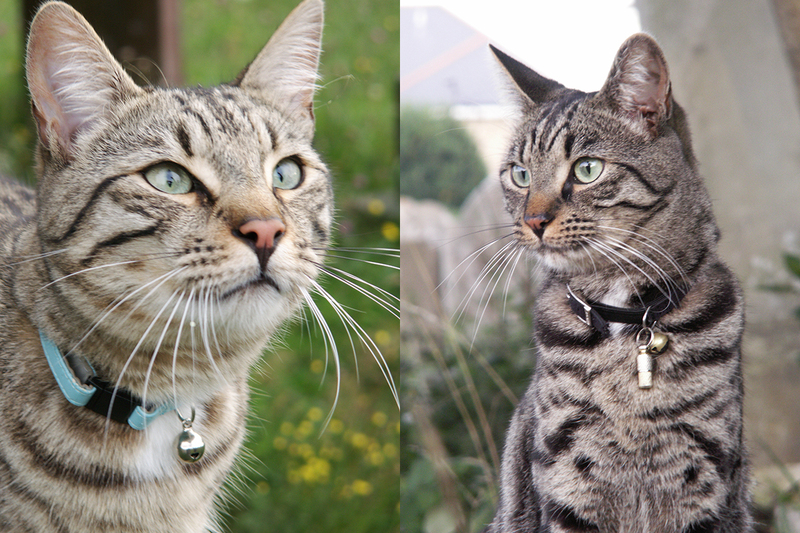 We have two cats, brothers, Jack and Bill. They don’t like each other much and they are very different characters. Their favourite food is cucumber and green beans! They are both really sweet in their own way and they both ‘talk’ a lot. Jack Kat is more T’s cat than mine, he is very smart and always seems to be a tad tetchy (probably because he has to share the house with Bill). Billy Kat seems to be ‘my boy’, he’s a bit of a dope to be honest and when he is inside the house he is sweetness personified and usually sleeps on the bed with me. Outside he is a mean, lean and deadly hunter and is very territorial. The other day he trotted back home with a large rat in his mouth. Fortunately it was dead and T was around to deal with it, I’m a bit squeamish about things like that. On Saturday morning I decided not to get up early for a change. T let ‘the boys’ out at about 5am and then came back to bed. I was woken at 7am by the sound of screeching and caterwauling coming from outside. I recognised immediately is was ‘my boy’ so I got up and rushed downstairs and out on the decking and called “Billy, Billy, Billy”. He soon trotted through the hedge into the garden, but would not come to me, he just sat underneath the decking looking ‘sheepish’ (if that’s possible for a cat). About an hour later I found him sitting outside the back door on the step and when I let him in he was hobbling and holding his left front paw up in the air. Apart from that he didn’t seem too distressed so I waited until T got up a while later and then I held Bill while T examined his foot – nothing was broken and all his claws were still there. A few weeks ago Bill came home with a sore and swollen paw and we had to take him to the vets. That time he had ripped a claw out and the vet gave him antibiotics and some pain killer/anti-inflammatory medicine – it cost a fortune! As there seemed to be no obvious injury this time we decided to give him some of the pain killer (fortunately we had some left over), keep him in and under observation with the idea of taking him to vets tomorrow if necessary. I don’t know what is in that medicine but he was ‘stoned’, pain free and more sleepy than usual all day yesterday. Today he looks like he has a slight hangover but he’s not limping any more and his foot hasn’t swollen. While he was recuperating yesterday Jack Kat came in from the garden, went up and had a close look at Bill to make sure he was OK and then smacked him on the side of his head as if to say “That’s for being so stupid!”. 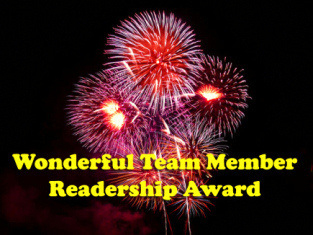 and 2) to nominate 14 other bloggers for the same award. That’s going to be the problem for me. It’s not that I don’t know of 14 deserving blogs, but right now I am totally overwhelmed with ‘stuff’ to do and I fear I am going to fail at this part of the obligation. In about a month’s time the local history group is putting on a big 2-day exhibition for National Heritage Open Days in an old disused church in the town and I am tasked with preparing the part of the exhibition which is about photographers from the towns past, so that also has a strict deadline which I just cannot afford to miss. As well as doing research, it also involves a lot of typing, printing and laminating, then designing how it is all going to go together on the display boards. I will also have to design the poster for the event and various other bits and pieces related to it. On top of that as well as keeping up with this blog I need to make sure the Ryde Social Heritage Group website is kept up to date, there’s no point having a website if it’s not kept fresh and interesting. I’ve got to sort out my car which has recently decided to start ‘playing up’ and may result in my having to trade it in for a newer used car. Then there are are various meetings and functions to attend which I have to do in my role as Chairman of the local history group. It’s all good, but it’s also all very time consuming and I have a full time job as well. If only I didn’t have to work all the time life would be so much easier 🙂 I am going to feel very guilty if I don’t manage to nominate other blogs, but realistically I just don’t know where I am going to find the time….. Please don’t think I am saying ‘Oh poor me’ because I am not, I really think my life is good right now, busy is good for me, but I am just being realistic. As someone who never had children I have always been in awe of women who do ‘all that stuff’ AND bring up a family as well. Ladies, I take my hat off to you, you are the ones who really deserve the awards. Thank you again Tess, it was lovely of you to think of me.